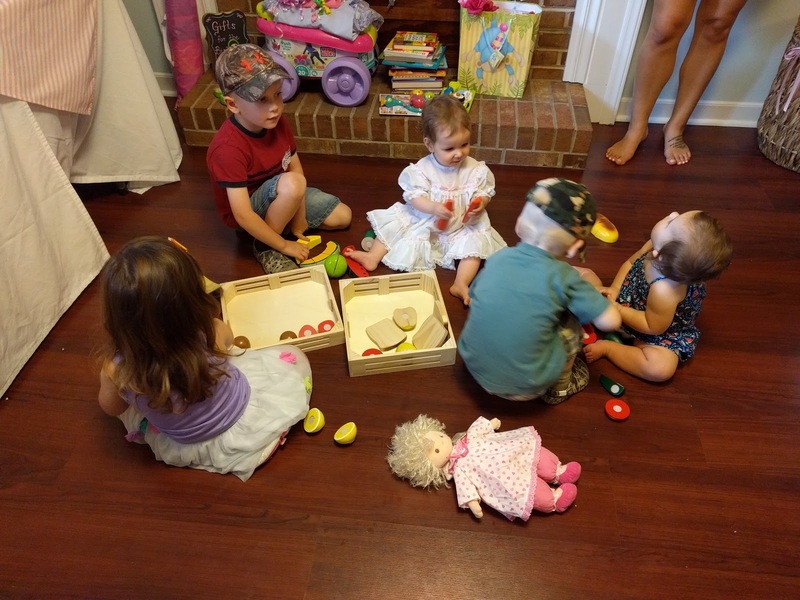 It's a Horvath's Life: A Hot Air Balloon First Birthday Party! A Hot Air Balloon First Birthday Party! My little sweetheart Georgia is turning one this week! I can't believe how fast this past year has gone. Some nights seemed like they would never end, but here she is 12 months later, sleeping through the night, napping in her crib, eating real food, crawling, pulling up and saying "Dada" like a big girl. 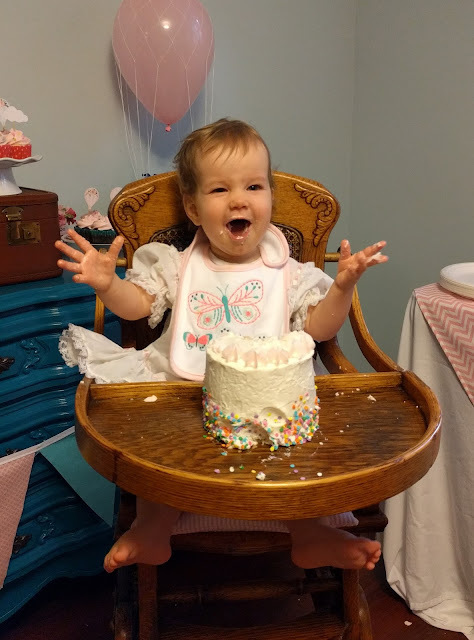 Of course we have many wonderful milestones and memories ahead of us, but this past weekend we celebrated her first birthday with a big party with all our friends and family. 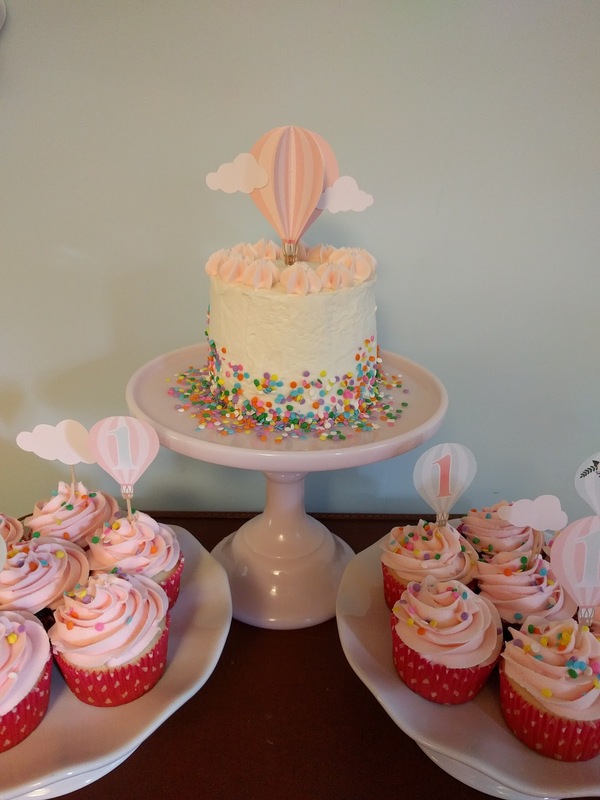 The theme was a continuation of my baby shower and her pretty pink nursery: hot air balloons with a rainbow of pastel hues. I decorated with rainbow crepe paper streams, white "cloud" balloon clusters and baskets with balloons tied with nets and filled with flowers. Paper hot air balloons and clouds (from the nursery) adorned the walls and ceiling. 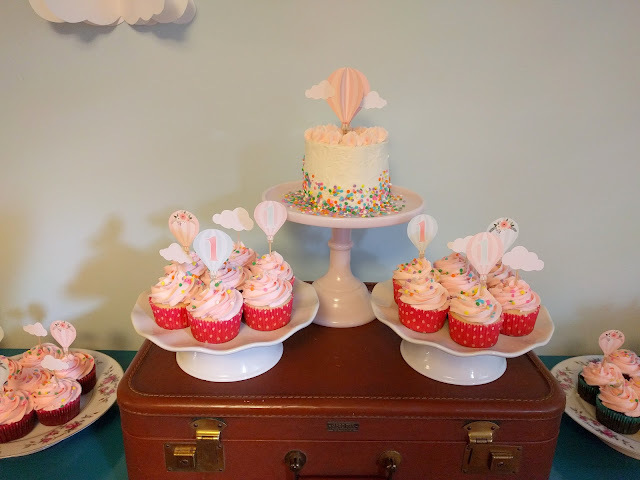 The dessert table was complete with a vintage suitcase for decoration, cupcakes and a little rainbow sprinkled smash cake for the birthday girl. For the balloon topper I printed the graphic three times, cut around it and sewed down the center. Then I fanned out the layers to create a dimensional effect. I added the little cutout clouds last and glued the topper to a stick to place it on the cake. On the dinner buffet we had pulled pork, hot dogs, macaroni and cheese, tortellini salad, coleslaw, fruit and chips. The chips I displayed in a wicker picnic basket suitcase for a fun touch! Georgia loved playing in the basket. :) And it managed to withstand a deluge of party guests and children, too! At the party, we asked guests to write a note for Georgia to open on her 18th birthday. We are going to box up her "time capsule" with photos and mementos from the party for her to open in 17 years. 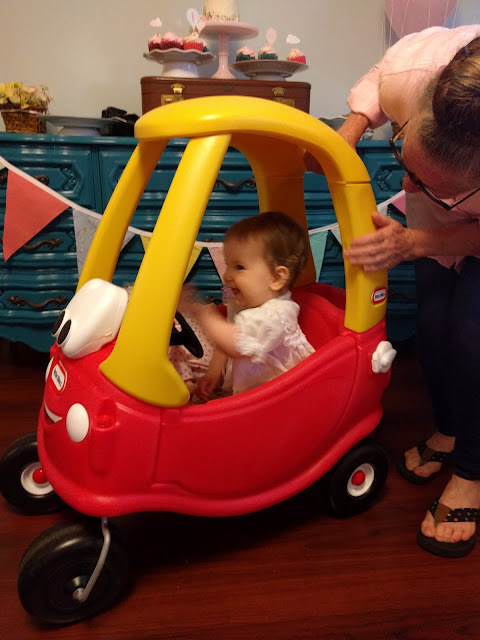 Hopefully she'll enjoy a look back at her first birthday and appreciate the advice and wishes from family and friends. Favors for the little guests included watercolors, bubbles and blow pops! Outside on the deck, we had our beverage station on the potting bench. Despite the torrential rain that started minutes after the party began, everyone had a good time dodging raindrops and some even braved the storm and sat under the porch. We had a wonderful time celebrating our little girl's birthday. Thanks to everyone who came to the party. Georgia is lucky to have such wonderful friends and family! Wonderful party! You are so talented!